Hey everybody! 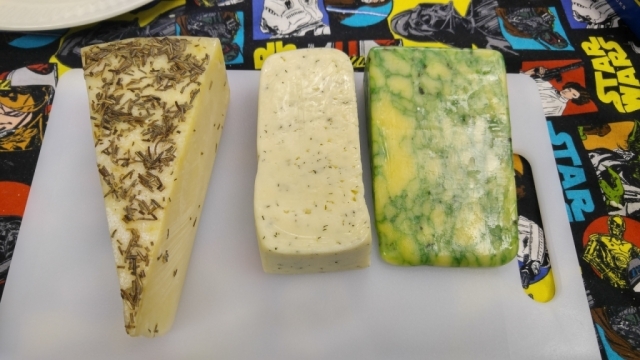 All three cheeses today were herb infused bundles of decadence, but one of them was wretchedly fantastic. Not quite "Push-Your-Mom-Down-The-Stairs" good, but maybe "Push-Somebody-Else’s-Mom-Down-The-Stairs" good. On the left, we’ve got Sartori Rosemary and Olive Oil Asiago. Sartori’s Asiago is already a stellar slice of deliciousness, but add some rosemary and a bit of olive oil and it transforms into pure delight. If you can find it, get it. You won’t be disappointed. In the middle is Dofino Dill Havarti. If you like dill, this is a must try. If you don’t like dill, then you should still try it since the dill flavor is really not that strong, and it pairs so well with the creamy bite of the Havarti. A great cheese, but the clear loser of the day. On the right, with bursts of light and an angelic choir, is Belton Farm Sage Derby. Holy Moly is this an incredible cheese! Derby cheese is a close cousin of Cheddar, but it is chock full of sage. On first contact with your tongue, the cheese flavor is sharp and clear, but as time goes on the sage quickly blossoms through the cheese and comes to the forefront. This is one of my all time favorites, up there close to No Woman and Humboldt Fog, though certainly no displacing either of them. I am so happy that I found this one again after a three year search!